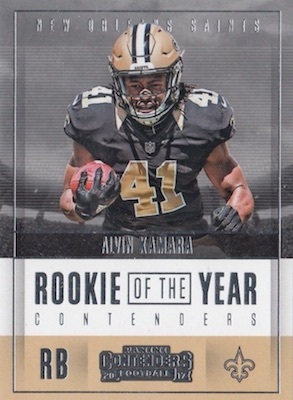 For many collectors, 2017 Panini Contenders Football offers the key NFL rookie cards of the year, and that is due in large part to the on-card signatures and possibility for short prints. Autographs average five to six per hobby box, with one to two being hard-signed RPS cards. 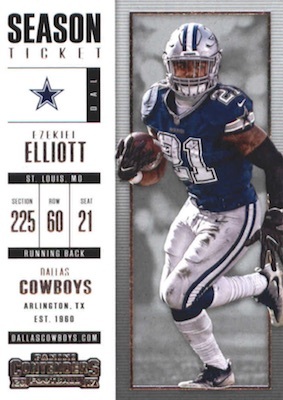 Just like the 2016 Contenders set, much of the excitement revolves around the image variations. Of course, many of the same first-year players are available with an NCAA theme in 2017 Contenders Draft Picks Football. 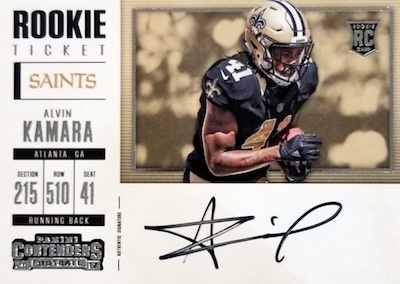 Featuring 400 cards, the primary 2017 Panini Contenders Football checklist starts with the base Season Ticket cards, followed by autographed Rookie Ticket and Rookie Ticket Variations. Even the non-rookies get in on the action with Coaches Ticket cards and the new Veteran Ticket Autographs. Rookie Ticket parallels include Playoff Ticket, Championship Ticket, Cracked Ice Ticket (#/25), Super Bowl Ticket and Printing Plates (1/1). 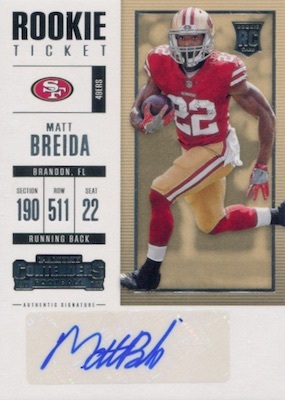 While several subsets in the base release come signed, there are also quite a few other autographs in 2017 Contenders NFL. 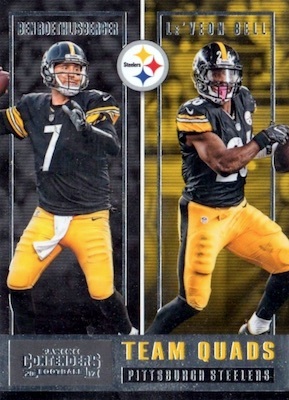 The Draft Class Autograph insert zeroes in on the best rookies with limited Gold (#/17) and Platinum (1/1) parallels, while Round Numbers Dual Autograph (#/99 or less) cards combine first-year players drafted in the same round. There are also Rookie of the Year Contenders autographs that try to identify the frontrunners for ROY. 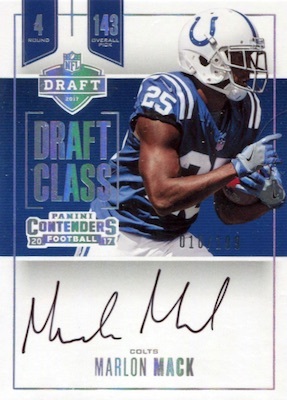 In addition, fans can find 2017 Panini Contenders Football autographs for retired players with Legendary Contenders Autographs (#/49 or less). 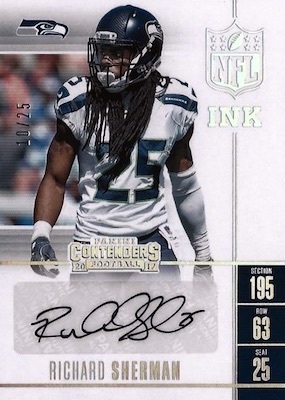 The current stars come via MVP Contenders Autographs (#/49 or less), NFL Ink and Sophomore Contenders Autographs. 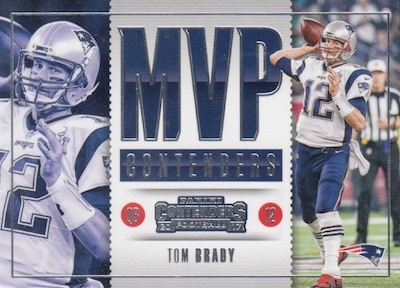 Combining to fall 18 per hobby box, inserts consist of Legendary Contenders, MVP Contenders and Rookie of the Year Contenders, as well as Round Numbers and Team Quads. On the premium side are hobby-only Silver Ticket (#/2) and 14-karat Golden Ticket (1/1) cards. 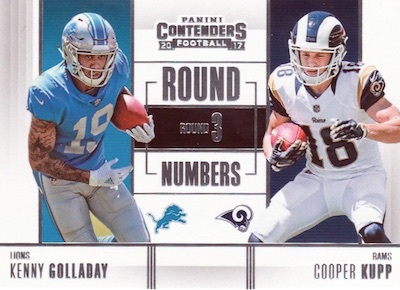 Finally, retail fans get an early crack at 2017 Panini Contenders Football blasters featuring one hit per box. These five-pack boxes have exclusive Rookie Ticket Swatches memorabilia cards. In addition, blasters and standard retail boxes both offer exclusive Emerald parallels. 2017 Panini Contenders Zay Jones Cracked Ice Auto RC #20 23 Mint! COREY DAVIS 2017 Contenders Premium GOLD RC Rookie Ticket Auto # 10 SSP Titans! TICKET PARALLELS: Red Zone (FOTL), Playoff #/249, Championship #/99, Cracked Ice #/25, Super Bowl 1/1, Printing Plates 1/1. 100 cards. Shop rookie autographs on eBay. TICKET PARALLELS: Playoff #/99 or #/49, Championship #/49 or #/25, Cracked Ice #/25, Super Bowl 1/1, Printing Plates 1/1. SHORT PRINTS: SP = 250 or less; SSP = 100 or less. Exact print runs noted on tab above. See specific parallel print runs with the spreadsheet. 99 cards. Shop rookie autographs on eBay. TICKET PARALLELS: Playoff #/49, Cracked Ice #/25, Championship #/25, Super Bowl 1/1, Printing Plates 1/1. 40 cards. Shop rookie autographs on eBay. 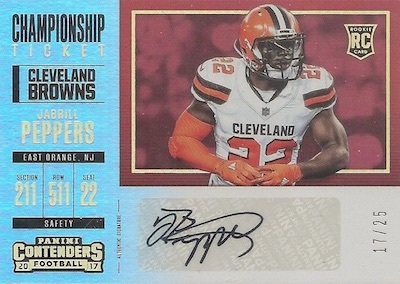 TICKET PARALLELS: Red Zone SP (FOTL - 100 copies or less), Playoff #/99 or less, Championship #/49 or less, Cracked Ice #/25, Super Bowl 1/1, Printing Plates 1/1. 40 cards. Shop on eBay. 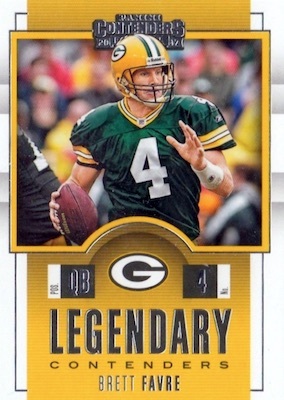 TICKET PARALLELS: Playoff #/49 or less, Cracked Ice #/25, Championship #/25 or less, Super Bowl 1/1, Printing Plates 1/1. 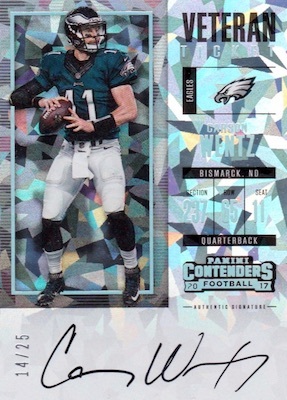 TICKET PARALLELS: Playoff #/99 or less, Championship #/49 or less, Cracked Ice #/25, Super Bowl 1/1, Printing Plates 1/1. 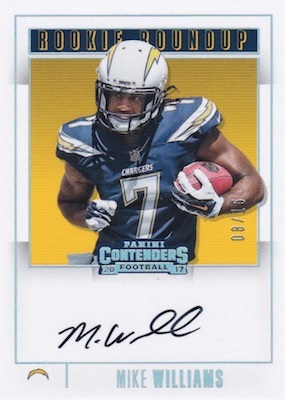 PARALLEL CARDS: Gold #/17, Platinum 1/1 (No Mike Williams*). PARALLEL CARDS: Emerald, Silver #/199, Gold #/99, Platinum #/25. PARALLEL CARDS: Gold #/10 or less, Platinum 1/1. PARALLEL CARDS: Gold #/25 or less, Platinum 1/1. Cards #1-30 noted as RPS. PARALLEL CARDS: Gold #/10 or #/5, Platinum 1/1. PARALLEL CARDS: Gold #/5 or less, Platinum 1/1. The cards (I hope) will be fine. But Jeremey Hill gets a card while Frank Gore, Justin Tucker, Calais Campbell, and about 30 other better players don’t? And why are all the RCs auto’d. I just want a plain, nice RC. How much longer is this Panini deal on for? Cards are clean. As usual the ticket design is well done. The only thing that could have made it better would be a few more numbered inserts and parallels. 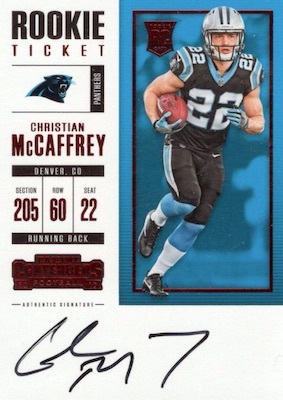 Can’t complain too much cause my early 1st off the line box had a red foil on card Christian McCaffrey auto. 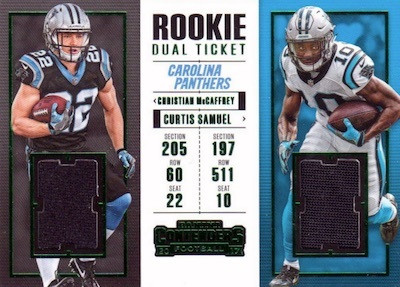 It is amazing that the retail contenders has been out for over a week and it is the day before hobby is releasing and we can’t get hands on a checklist. Guys participating in case breaks would really like to know what there is for our teams before committing $$$$ to the spots we collect. Come on PANINI. really weak. You get 5 to 10 decent cards in a case. 3 to 5 good autos if you are lucky. Compare, for instance, with this years Rookies and Stars where you would get at least 10 great autos, some 15 to 20 great cards including some very low number stuff. For a fraction of the price. Contenders this year is the biggest rip off ever seen. Contenders has always had QC issues which is what made the chase for gradeable cards fun. This year the QC is so bad I will not be buying any. I have not seen one cracked ice, championship ticket, or any parallel auto where the entire back is chipped so bad that the edges are almost completely white. 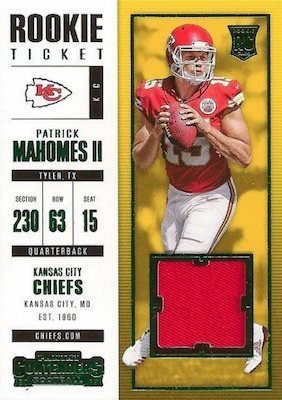 It’s a shame, because this is one of my favorite products that I will not touch this year…I doubt you will see any 9.5/10 cards out of this set…stay away if you care about grade. Standard to previous Contenders years. I have noticed on eBay though a few listings which have all of the foil missing on the front of the card? a tom brady just sold for what looks for 50 bucks. the foil is missing the border around the photo, name, section, row, seat, team name, and panini contenders football at the bottom. does anyone have any information if these are misprinted, or common? Does Anyone know how Panini Rewards works for getting the cards with the ** I got a 250 point card in my case and would like to use it to finish the set. I bought 2 boxes and got Kareem Hunt Redemption in one, and Christian McCaffrey Variation in the other. 10 Autos with 1 Printing Plate, and 2 Playoff. 1 Cracked Ice per box Flacco and Vinatieri. 4 out of 5 Stars because of Price. 2017 Panini CONTENDERS Football Factory Sealed HOBBY Box *Patrick Mahomes RC?? ?